Can I just take a moment to say that while I was working on this post, I was suddenly struck with how overwhelmingly grateful I am to have this platform and to share my outfits and heart with you every day? I don’t know what it was! Maybe I just really liked this outfit haha! I just love being able to do this every day. Thanks so much for reading! I’m curious about how many of you feel like you’re in your ideal work situation? How many of you work in what you consider to be your dream job? I know that I feel like I get to be in mine and am so grateful for it. I obviously have a lot of blogger gal pals, and I LOVE that! So many of YOU who read daily are bloggers. As a blogger, it almost feels like other bloggers are your co-workers. I told someone that recently. When you have a struggle with a brand or someone you’re working with, a contract, a business relationship, etc, the person you go to is another blogger to vent. It can be an isolating job, so it’s really great to have close relationships with other girls who are in the same field. I’ve been thinking a lot lately about peaks and valleys, careerwise. We all have hard times at work and times we feel our careers aren’t where we feel they should be. Have you ever felt like you’re stalling out? I feel like lately so many of my friends have expressed frustration with different aspects of their work life. I’ve noticed it most amongst my blogger friends… everyone is constantly in a state of tailspin, be it over problems with a brand relationship, friends not taking our work seriously, or frustrations over the maddening Instagram algorithm. And while a vent sesh is in order from time to time, I think it’s important that we take the time to be grateful and to marvel at the fact that THIS gets to be our job. We run our own businesses, tell stories, share our hearts, all day every day with the people who care to read about it. We’ve created our dream jobs. HOW COOL IS THAT? It’s a lesson for non-bloggers as well. The traditional workplace can be draining and exhausting. Co-workers beat us out for promotions, bosses are crazy, clients can be unreasonable… it’s easy to get sucked into the negative. At the end of the day, though, it’s so important to be in a situation that you ultimately love and not lose sight of the things that matter. And if you’re not in an ideal situation– I think it’s important to have the courage to walk away and create the ideal situation for yourself. Find your passion. There’s no reason you should hate your job. Find the job that fills you with joy. If you can’t find it, make it for yourself! It’s such an interesting time right now… the internet has truly opened up a world of possibility for EVERYONE. There’s no reason why you should be stuck in a situation you hate. This outfit? Lol! Isn’t this top the cutest? 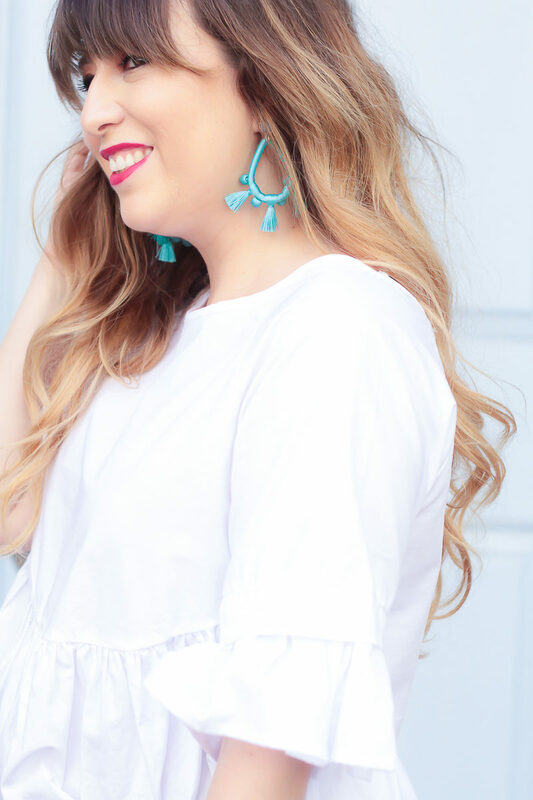 I love the ruffle sleeve and the high low peplum… I like that it’s a little longer in the back and a little shorter in the front… sort of like a mullet top I guess haha! The criss cross back is super cute. This top will be so, so cute with denim cutoffs or my white jeans as well. 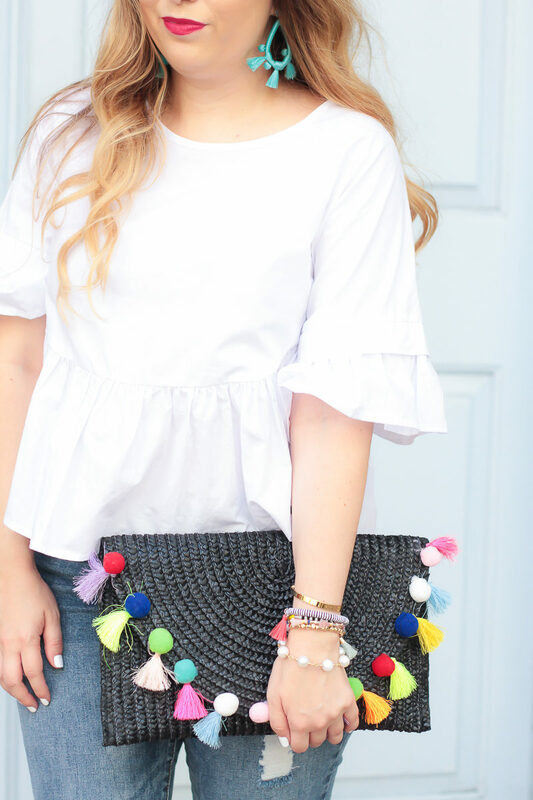 It’s a surprisingly versatile little top! Plus, at only $14 it’s a total steal. 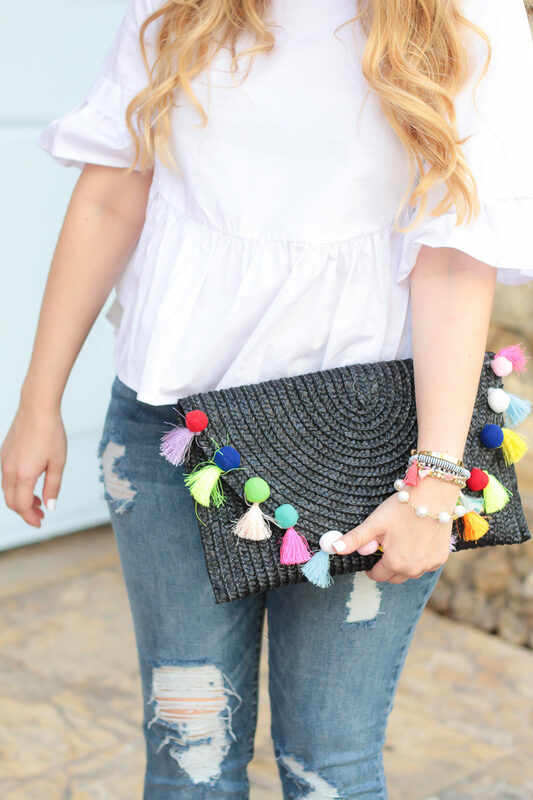 A cute little white top and jeans is the perfect canvas for some bright bold accessories. These great STS Blue jeans came in the mail last week and I’ve been wearing them non-stop since! The distressing is perfect and they’re soft and stretchy… super comfortable. Thanks so much for reading! I’d love to hear– are you in your ideal work situation? What does that look like for you? Hit the comments and let me know.